On 18 March 1945, the USS Alaska made her first contact with the enemy. Operating about 100 miles south of Kyushu, the Alaska was one of several heavy vessels (including her sister ship USS Guam) whose mission was to protect five carriers from air attacks. 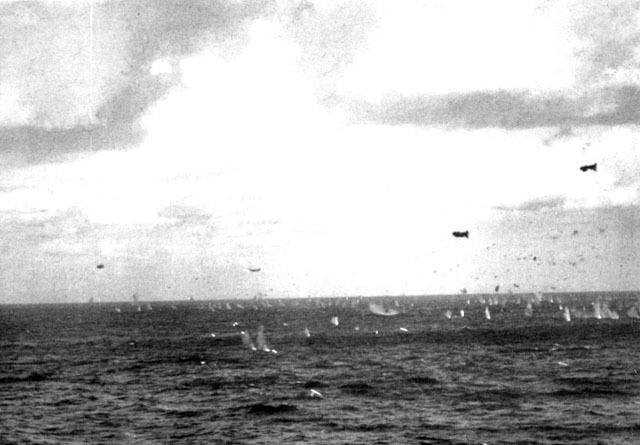 The whole group, carriers, heavy ships and destroyers, was a component of Task Force 58, which, under the command of Vice Admiral Marc Mitscher, had been striking heavy blows on Japanese air fields, shipping and planes. On this particular morning, at ten minutes after eight, a twin-engine Japanese bomber attempted a suicide attack on one of the carriers next to the Alaska in the formation. The attacking plane came in fairly low from astern of the task group, entering a shallow dive about four miles from its intended target and offering the Alaska’s anti-aircraft batteries a magnificent opportunity to work out on live game. For the first time, our guns were shooting at a real plane and not at a sleeve or a drone. The gun crews “turned to” with a will, 5-inch, 40-mm and 20-mm, all the guns that could bear on the big bomber pumping out projectiles at maximum rate of fire. Hits were scored almost immediately and within a few seconds the Jap was in flames-but kept on coming straight in, diving more steeply now for the carrier’s stern. Less than half a mile from the carrier the incendiary bullets found the gas tanks and the plane exploded in the air, its momentum carrying it-a huge ball of fireinto the sea on the carrier’s quarter. Alaska’s long months of training had paid off its first dividend.